Nudges have become a popular tool for behaviour change; but, some interventions fail to replicate, even when the identical, previously successful intervention is used. One cause of this problem is that people default to using some of or all of the previously-successful existing nudges for any problem—the “kitchen sink” approach. We argue that the success of an intervention depends on understanding people’s current behaviour and beliefs to ensure that any nudge will actually “budge” them from their current beliefs. We introduce the Beliefs–Barriers–Context model, with three components: understanding beliefs, barriers, and context to change behaviour through a budge. Designing a budge has the goal of identifying the psychological mechanism that drives a target behaviour, focusing on the psychology of the target population before attempting to change that behaviour. In contrast to the “kitchen sink” approach, budges are best complemented with mechanism experiments to identify what undergirds behaviour change. Moving away from simply nudging behaviour to budging minds—by understanding beliefs, barriers and context—has the potential to inform both the successes and failures of behavioural interventions. Behavioural science has taken the academic, policy and business worlds by storm: the notion that small changes in the decision environment can have sizeable effects on behaviour received notable attention in academic and popular outlets (Ariely 2008; Kahneman 2011; Thaler and Sunstein 2008). For example, the Behavioural Insights Team, established in 2010 in the UK Cabinet Office, demonstrated that the timeliness of tax payments can be affected by the mere mention of the level of descriptive social norms (Cialdini 1987; Hallsworth et al. 2016, 2017). Behavioural science units around the world have been established inside governments and corporations, and examples of effective behavioural interventions abound: from reducing unethical behaviour by placing signature boxes at the top of forms (Shu et al. 2012) to increasing voter turnout through increased accountability (Rogers et al. 2016) to encouraging people to engage in preventive health measures (Milkman et al. 2011). These successes suggest that behaviourally-informed approached can be effective and beneficial for society and individuals—especially compared to more costly, alternative policy tools. Indeed, a recent analysis of behavioural compared to traditional policy interventions recommends that governments should further invest in the former as the most cost-effective policy-making tool (Benartzi et al. 2017). At the same time, behavioural interventions can begin to seem like a hodgepodge of interesting but unrelated—or even incoherent—findings, a common problem when academic disciplines are in their infancy. Practitioners routinely rely on published interventions shown to be effective in a university laboratory setting (or, wherever available, in a natural field setting) and implement the same (or very similar) intervention in a field experiment. Most of these early implementations have focused on the practical hurdles to overcome when designing and implementing a behavioural intervention in a randomized field experiment (Hauser et al. 2017; Hauser and Luca 2015; Haynes et al. 2012; List 2006; Podsakoff and Podsakoff 2018), but few have provided decision rules to decide when to use what type of intervention. 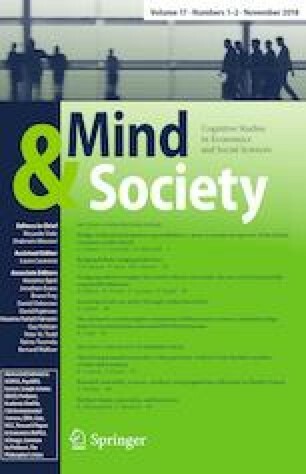 Consider the useful “MINDSPACE” and “EAST” frameworks (Dolan et al. 2012; The Behavioural Insights Team 2014), where each letter in each stands for a factor useful to consider in designing an intervention (e.g. “T” in EAST: timeliness of the intervention; “M” in MINDSPACE: the messenger who conveys the intervention). These guides are certainly helpful and will continue to aid practitioners and academics alike but they have also had an unintended side effect. Not all contexts or interventions require “checking off” each letter of the acronym. That is, despite the authors’ intentions, many practitioners may use these frameworks to hope to design the “best” interventions by checking off each of the letters in the acronym, believing that more is better. Indeed, people have been shown to have a tendency to “complete” any arbitrary set (e.g. continue working on a task until a pie chart tracking performance is full; see (Barasz et al. 2017)), so checking off every letter may seem like a good idea at the time, but further contributes to the “kitchen sink” approach which is no longer tailored to a specific context or problem. Here we argue for a complementary approach: providing practitioners and academics to a systematic decision rule (the BBC model) to identify where the problem lies before jumping to designing an intervention based on these acronyms (although we continue to believe that these acro. We suggest that one solution to this issue is to move from first thinking which of the existing toolkit of interventions to apply—from social norms (Cialdini and Trost 1998; Hauser et al. 2018; Luca and Hauser 2016) to defaults (Jachimowicz et al. 2019) to anchoring (Furnham and Boo 2011)—to first thinking about the underlying psychology of the target population, and the underlying psychology of the target problem. To oversimply, whereas nudges have tended to focus on changing behaviour, we suggest focusing first on the psychological mechanisms likely to be at play in a given population in a given context—one such method could be to first understand minds in order to budge minds, and thereby nudge behaviour. 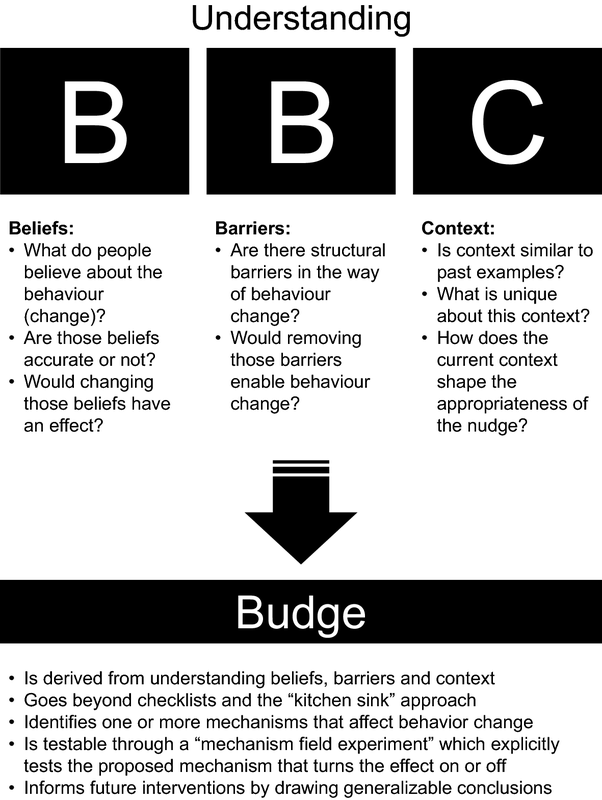 We introduce an adaptive framework for designing effective behavioural nudges, using what we term “budges.” We call this framework “Beliefs-Barriers-Context Model” (or “BBC Model”) which includes three parameters essential for designing a successful intervention, or budge (see Fig. 1). The three parameters should not be viewed in order of execution or importance, which will differ depending on the context, the population, and the problem. The first parameter “B” refers to gaining a deep understanding the existing beliefs in the target population. What do people currently believe about the behaviour targeted for change, and are those beliefs accurate or inaccurate? Would changing those beliefs meaningfully affect the subsequent behaviour of interest? For example, past research has found that people hold inaccurate beliefs about the distribution of incomes in the United States, Australia and elsewhere and prefer a much more equal distribution of incomes (Hauser and Norton 2017; Hauser et al. 2016; Kiatpongsan and Norton 2014; Norton and Ariely 2011). It thus seems plausible that correcting those beliefs could affect preferences for redistribution and subsequent behaviour; indeed, (Kuziemko et al. 2015) find that preference for the estate tax are shifted towards more redistribution when people have their inaccurate beliefs corrected. Note that the beliefs that shape our behaviour need not always be “conscious” or fully accessible to our cognition: since much of our decision-making happens automatically (Kahneman 2011), has been shaped by our experience and repeated actions (Aarts et al. 1998) and even through ecological adaptation (Gigerenzer and Gaissmaier 2011; Goldstein and Gigerenzer 2002), beliefs sometimes form after behaviour has occurred. Indeed, when we make decisions without going through a deliberate thought process, we sometimes retrospectively bring in line our belief system with our actions after they have occurred (Ariely and Norton 2008). For example, many people might subconsciously form beliefs about the extent of income inequality in the country by, for instance, frequently observing their local environment and the extent to which they notice poverty on their way to commute (Sheehy-Skeffington et al. 2016). While they might not consciously be aware of this belief-generation process, those beliefs around poverty likely form an important part of any future (conscious) decision-making process involving taxation or charitable giving. In fact, such subconscious beliefs might lead to a (cognitive) barrier, making the person unwilling to change their behaviour—this brings us to the second parameter of the BBC model. The second “B” parameter stands for understanding barriers: are there are obvious (or less obvious) barriers in the way of a desired behaviour change? Removing barriers might be the first step to initiate behaviour change. One well-known example of a structural barrier to behaviour change in the context of healthy eating is that unhealthy foods are often placed in highly visible and convenient locations in cafeterias—tempting eaters to indulge. Removing this barrier to healthy eating—by placing foods such as fruits and vegetables in those convenient places—alters eating habits for the better (Thaler and Sunstein 2008). Another example is the availability and ease of access to other opportunities in life: for instance, adolescents in disadvantaged schools in Chicago who were offered minimum-wage jobs for 8 weeks during the summer were less likely to be arrested for violent crimes during and even after the job programme. By removing a structural barrier to entry, youths were able to gain access to, and learn about, the labour market as well as had an opportunity develop social skills, self-efficacy, and perceived control, which had a long-lasting effect on their behaviour (Heller 2014). The final letter “C” stands for understanding the context: the physical and social setting in which a behaviour takes place. Much has been written in sociology, organisational behaviour, and other social sciences about the importance of context; we refer the interested reader to (Cappelli and Sherer 1991; Johns 2006; Mowday and Sutton 1993) for a comprehensive overview. Taking the time to fully understand a given context requires in-depth research, often combining more than one research method including qualitative and inductive methodologies (Chatman and Flynn 2005). Understanding context can radically shift the prior of the likelihood that a given intervention will succeed, and also helps to refine the types of interventions that are most likely to resonate psychologically and result in behaviour change. For instance, evidence that context matters can be illustrated with a highly successful nudge: Shu et al. (2012) demonstrate that placing a signature box at the top of a form highlights an ethical “self-image” and reduced cheating on the form subsequently. This intervention has been replicated in other settings successfully (Congdon and Shankar 2015). However, it has also not replicated in other settings (e.g. (Bhanot 2017a; Kettle et al. 2017)): the moderating factor for this nudge seems to be one type of context, such that signatures that were collected digitally actually increased unethical behaviour, while traditional signatures made by hand decreased unethical behaviour (Chou 2015). We argue that the BBC model is a first step towards a comprehensive nudge theory. By focusing on beliefs and barriers, the framework is adaptable and general enough to apply for the design of most nudges, turning them into budges. Moreover, considering—and making changes to fit—the context not only increases the feasibility and likely success of an intervention, but also gives theoretical depth to the findings by taking moderating factors into account. We suggest that researchers would benefit greatly by exploring budges through the use of “mechanism experiments” (Ludwig et al. 2011): designing an experiment that explicitly tests the proposed underlying psychological mechanism of the behaviour can demonstrate whether the proposed mechanism is indeed the driver of behaviour. As just one example, even an effective application of social norms that changes behaviour may be due to a number of different causes: it might make people realize that the behaviour is more prevalent than they believed, it might change their sense that the behaviour is endorsed or moral, or may change their belief about how difficult the behaviour is to enact (the barriers). The results of a “mechanism experiment” to test which budge is driving behaviour are insightful in understanding the problem and solution better—even in the case of null findings. To illustrate the potential of budges, consider again the use of social norms, but in the context of reducing household energy consumption. Social norm interventions have been highly successful, such as in bringing forward late tax payments by showing peers’ timely payments (Hallsworth et al. 2017), decreasing the prevalence of unethical behaviour when interacting with government services (Hauser et al. 2018), and reducing energy and water usage by comparing nearby household usage (Allcott 2011; Allcott and Rogers 2014; Bhanot 2017b; Jachimowicz et al. 2018), but have not always worked successfully (e.g. (Silva and John 2017; Verkooijen et al. 2015)). How then can someone interested in changing a given behaviour in a given population in a given context know whether a social norm intervention will be effective in a new setting? In our experience, choosing which nudge to implement has largely been a matter of the existing evidence that a nudge worked in some other context. That is, if the same nudge has not been applied in the current context, the question quickly becomes: what is the most similar context where it did work? While this may be a useful strategy for some cases, it can also lead to looking very far afield for new context. In contrast, the starting point for budges is different: the question is whether and how a social norm intervention would affect the underlying psychology of the target population. In other words, it works by starting with the individual perspective, moving up to the specific context—rather than take insights from one macro-level context to another. For example, one predictor of the effectiveness of social norm interventions is that they convey new information to a decision-maker, in particular about their own behaviour relative to that of their peers (Schultz et al. 2007). If a social norm intervention would be likely to manipulate the beliefs people have about their and others behaviour, a social norm nudge might be applicable; if not, it is less likely to be effective. Why, however, should a policy-maker bother running such a laborious experiment, when it is often virtually costless to add both types of information to the intervention from the start? We believe there are at least two reasons for avoiding the “kitchen sink” approach. On a theoretical basis, it is important to be able to distinguish between the two types of information because it helps understand what drives the effect. As we have argued above, this understanding is key to generalise insights for future trials and interventions (for further discussion, we recommend (Ludwig et al. 2011)’s excellent “mechanism experiment” paper). But there is also a practical reason for not combining multiple nudges into one intervention lightly: despite the common intuition that “more is better”, this does not apply to simply combining nudges to change behaviour for the better—in fact, sometimes “more” can lead to worse outcomes. For instance, the Behavioural Insights Team ran a trial to increase organ donations after the annual car registration process. They varied the message that encouraged citizens to sign up to the organ donor register, relative to a control group without such a message. The best performing message, relative to control, was a message that invoked a sense of reciprocity; among other messages that did well was, yet again, a social norm message that many other people have signed up to the organ donor register. What happened when the social norm message was further “enhanced” with a nice-looking picture of a group of people, to further emphasise the social aspect of the intervention? Unexpectedly, this intervention significantly reduced sign-ups below the control group sign-up rate (The Behavioural Insights Team 2015). There are at least two lessons to be learned from this trial. First, combining different nudges will not always yield superior results and may sometimes even backfire. In this case, adding a picture to an otherwise successful intervention did not just cancel out the effect of the effective nudge, but also led to a welfare loss. In other words, while it may be costless to include more nudges in an intervention, it may be costly to do so with regards to the desired outcome. Second, this trial allows us to disentangle the effect of the social norm—which is good news and close to a mechanism experiment, which we have advocated for. However, it falls short in giving us fill insight into what drives all the results by not also including a condition with just a picture. Without this condition, we cannot tell whether the picture itself would have also led to lower sign up rates, or if the combination of social norms and picture is particularly harmful. To increase our understanding of “what works” and provide insights into future trials where social norms, pictures, and many other nudges may become relevant again, it would have been most useful to have the full experimental design with the missing cell (i.e. picture alone) included. Budges, we argue, are a form of intervention that systematically considers beliefs, barriers and context to create behaviour change. However, of course, we do not argue that all nudges will need to become “budges”—not every intervention will need to address beliefs, barriers and context, and we do not want the BBC model to become another “check list.” Rather, we see this framework as an opportunity to ask whether the researcher or policy-maker has a good grasp of the problem at hand and understands what it might take to change behaviour. For example, targeting beliefs will be most helpful when the researcher has reason to believe that the target audience has received incorrect information and would change its mind (and potentially behaviour) if they had access to alternative information. For example, information about the prevalence of a prosocial behaviour in the community (e.g. descriptive social norms of others’ donation amounts) is an example of shifting beliefs by providing previously hidden information and consequently changing behaviour (Shang and Croson 2009). There are, however, plenty of cases where this might not be the case—that is, situations where one’s beliefs would not be shifted or updated even if an intervention would provide new and relevant information. For example, people are motivated to avoid receiving information about charitable causes to have an excuse not to give (Exley and Petrie 2018) or they selectively seek and reinforce exposure to news outlets with politically aligned values, even when they are given other information from other sources (Garrett 2009). In short, the BBC model does not provide a checklist or a recipe of “ingredients to include” which always apply—instead, we offer a systematic approach to understanding what drives behaviour change, of which beliefs, barriers and contexts are common elements. However, a complete theory of behaviour change should, of course, recognise that behaviour is likely influenced by a myriad of factors, including but not limited to beliefs, structural barriers, context, available information, framing, cognitive limitations, and traditional economic considerations, such as prices and income effects. We propose a complementary process to the typical design of behavioural nudges, which we hope will offer researchers, policy-makers and organizations guidance on how best to select and design relevant nudges for their population, problem, and context—rather than throw the kitchen sink of nudges at every problem. The BBC model we propose has three components—understanding beliefs, barriers, and context—which help identify what beliefs need to be budged in order for behaviour to be nudged. This obviously implies that the policy problem (e.g. insufficient towel reuse, or even recycling in general) is smaller in Germany than in the US, and it begs the question when and where nudge (or budge) interventions are more effective—when the problem is still large and even small changes can lead to sizeable improvements (“low hanging fruit”) or when the policy problem is smaller but the scope is more defined? Future research will need to disentangle those effects, but current scholarship (and anecdotal evidence) might suggest that nudge strategies are more commonly employed for the former case. We do not want to imply that interventions in practice (e.g. at the many behavioural insights units around the world) are chosen completely at random, or without any consideration. In fact, often behavioural insights units have accumulated substantially amounts of knowledge of which interventions typically work based on their well-powered trials, and they sometimes also pre-test interventions in smaller, online samples before launching them more widely (Halpern 2015). Unfortunately, however, these insights are often turned into a “kitchen sink” intervention: based on the wealth of prior trials conducted, a “super condition” is constructed which contains multiple nudges which have worked in the past and might work in this situation, too. Sadly, these super conditions sometimes do not work as expected, but it cannot be determined why, given that multiple nudges confound the pathway—and even when they do work, little can be said about why for the same reason. Thus, we argue that even such seemingly practical, empirical approaches fall short on understanding the drivers behind the behaviour (change) and thus make it hard to generalise. Of note, we think many behavioural insights units are in an excellent position to run highly-powered trials that can be generalised, in part by considering the BBC model and by running “mechanism experiments” which we explain further below. Arguably, structural barriers could be viewed as part of each unique context. We do not disagree with this possibility but we think that some barriers have properties that span different contexts, which makes focusing on the barrier separately worthwhile. For instance, a structural barrier to citizens’ compliance might be that a required form is complicated to access or hard to find on the government website; whether the context is taxes payments or unemployment claims is likely less important than the cross-context barrier that the form is hard to locate. There are likely other beliefs that could be of interest. For example, (Jachimowicz et al. 2018) show that social norms to reduce energy consumption depends in part on the decision-makers’ beliefs about their neighbours’ beliefs of the importance on sustainable behaviour (“second-order beliefs”). This suggests that higher-order beliefs can also be influenced to nudge behaviour. To the best of our knowledge, a very similar experiment was run by the economists at Opower several years ago and they have continued to run randomised controlled trials to evaluate the performance of social norms in most of their new programmes since then, focusing primarily on the comparison between one’s own energy usage and one’s own usage plus neighbours’ usage (Allcott 2011; Allcott and Rogers 2014; Jachimowicz et al. 2018).